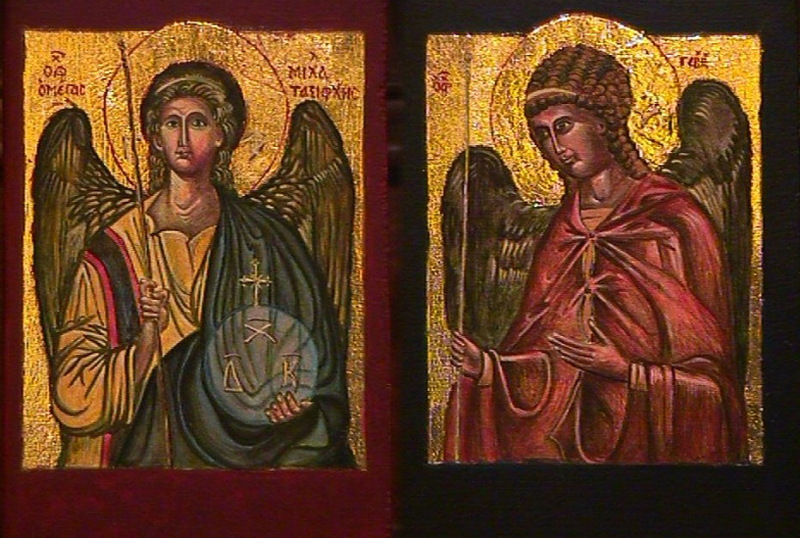 Michael and Gabriel — two of my earliest efforts at writing icons. They now stand on the gradine at St James Fordham. Of course there is that old image of the departed "getting their wings" and becoming angels themselves, in the fashion of Clarence from It's a Wonderful Life. Jesus himself observed that at the resurrection those deemed worthy of it would be "like the angels" (attested by Matthew, Mark and Luke; while John does the reverse to have the angel declare that he is only a fellow servant...). So the long and the short of it is that the heavenly realm is well-populated, and we hope one day to join the population. Whether we become angels or get a work-permit, there will be the endless work of praise to do. In the place beyond time and space, the placeless place, we hope to rejoice forever in timelessness, in pure being-like the Ground of all being, the Three-in-One whose only deed is Love. All you saints and angels, praise the Lord! Alleluia. The full set of icons at the altar of Saint James Church Fordham. What beautiful icons, Tobias. Thank you for a lovely post on angelic beings. When I visited the Convento de San Marco, the monastery in Florence which housed both Fra Angelico and Savonarola, and which is now an art museum, I felt that I tasted a bit of the flavor of the heavenly places. Surrounded by paintings and frescos of Madonnas and angels and saints, how could one feel otherwise? Well, I suppose some could, but the monastery is definitely one of the thin places for me. And there's this image of a guardian angel, or one very like it, which followed me through my classrooms in my RC elementary school. I'm somewhat embarrassed to link to my own blog, but it was the easiest link to the image I wanted. Thanks, Mimi. I hope to visit Italy one day, especially Florence. With a name Tobias I'm ever conscious of the tradition of the guardian angels! Raphael is near! Off to St Mike's (Carmichael CA) this evening to celebrate our patronal feast (bishop is coming, we're dedicating&blessing our new labyrinth): JOY! Your early efforts imho are wonderfully written in a way that reminds me of the some the best I've seen from the early centuries. Is this your parish? Also, since the word saint itself is derived from holy, it makes some sense to extend the word not just to human beings, but to all who dwell in God--and I think that is not just through the veil. For that matter, I would extend the term to other creatures of flesh and blood, as was done with St Guinefort and other attempts that upset a humanocentric salvation-cart. Thanks, JCF snd Christopher. I'm about to head up to celebrate the 5pm liturgy for the day. Yes, this is my parish, C. I like the broadening of salvation to include all those other creatures, and even go beyond flesh and blood -- I love the sacred songs exhorting trees and geology and weather to praise God, not just "everything that has breath"!